Tottenham chairman Daniel Levy has confirmed that the club have ‘registered an interest’ in upping sticks and moving to the Olympic Stadium in Stratford, northeast London, after the culmination of the 2012 games renders it one of many vacant £multi-million follies. “I can confirm we have registered an interest in the Olympic Stadium site within the deadline of September 30th, in conjunction with AEG (who own the site). “Clearly we are delighted with this unanimous decision and are grateful to all those who expressed such clear support for the plans. I should stress that there is still much work to be done. We shall continue to work with Haringey Council and the application will now be considered by the Mayor of London and referred to the Secretary of State. Christ! You might want to put on a hard-hat if you’re out and about, as it’s raining stadiums in north London this morning. 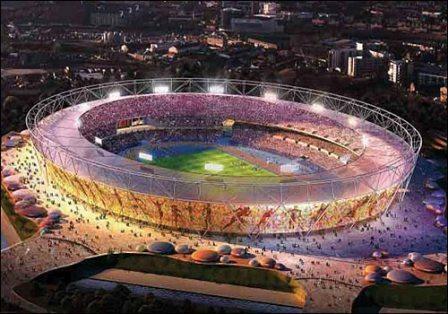 can I have permission to use the image of the Olympic Stadium shown here. Braiswick Photo co. of manningtree are using it and I would also like permission. Hello can I use the same image stated above please.